folding shower stool With Moulded Plastic Feet. 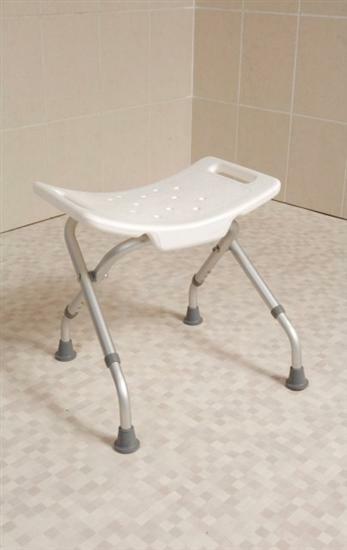 Economy priced portable folding shower stool with high quality moulded plastic seat and corrosion resistant, reinforced aluminium frame. Folds easily for storage and ideal for travel use. Textured seat to avoid slipping and comes with drainage holes. This is exactly what we needed for an elderly relative who had suffered a couple of strokes. It is very sturdy and he felt completely secure on it. 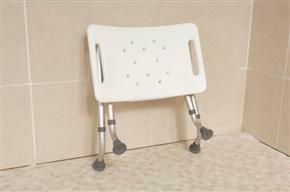 The handles at the side made it easier for him to get on and off, it folds away neatly and is easy to clean. I would recommend this item. Very fast delivery and the seat was very sturdy and well made. Robust and lightweight, just what was needed ...... and at a very reasonable price!